After spending more then a few minutes browsing these pages you may be wondering why would anyone honestly care about this stuff so much to make this site? I have loved history and old buildings as long as I can remember. Being an inquisitive fellow I like to know why things are the way they are. Thus I was drawn to the ruins of Detroit. To me these buildings represent the past and future of the city. They include many of the most prominent public spaces in the city. The auditoriums of the United Artists and Madison, the ballrooms of the Statler and Book-Cadillac, the waiting room of the Michigan Central Depot. These places are of amazing historical significance to the city. Not just in its political and social life, but to the lives of the thousands who passed through their doors. They are places the city cannot afford to lose. 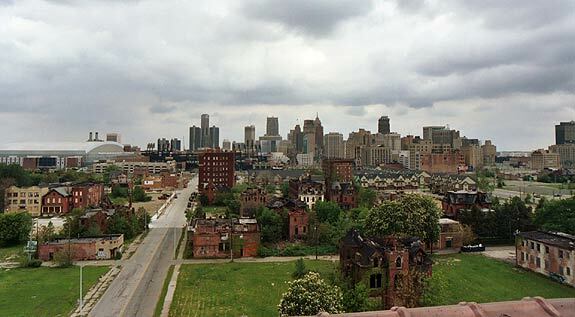 Now that Detroit is recovering from its 40 year decline the ruins question is being faced. Should they be demolished for a new development, or refurbished? I am a staunch preservationist. It is my opinion that they MUST be restored. Any development is good but a reopened Statler or Book-Cadillac would only make Detroit greater. This site is a presentation of the historical and present day information I have compiled on some of these buildings. I have spent a great deal of time digging up facts and photos of these places. In 1999 I was fortunate enough to tour many of the major ruins. My intent with the site is to preserve the memory, and hopefully shape opinions in favor of the preservation of these landmarks. David Kohrman is graduate from Western Michigan University and Ball State University and holds an MS in Historic Preservation. He likes old buildings , Legos, The A-Team, Bond movies, and other fun things.